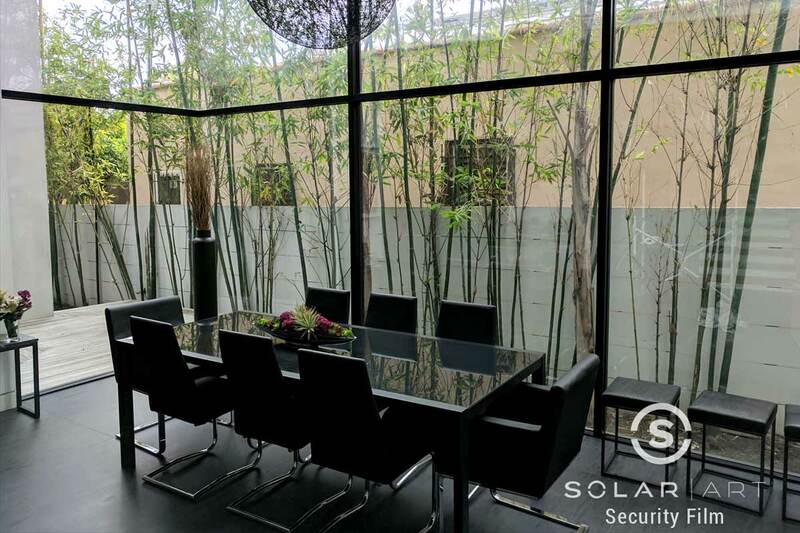 Solar Art recently installed security window film to a gorgeous home in Beverly Hills, California! As you can tell this home has large wall glass all throughout it. While this creates a modern look and lets in a ton of natural light, it also gives outsiders full view into their home which could potentially be a safety concern. They didn’t want to give up these gorgeous glass walls and they didn’t want to defeat the purpose of them by having shades or blinds installed, so they reached out to Solar Art to see what their window film options were. They worked with our sales representative and decided to go with a security window film. They could have gone with a reflective window film or another solar film that would have made it more difficult for outsiders to see in, but they didn’t want to change the aesthetics of the house. They went with security window film because the aesthetics wouldn’t change and they would have added security in their home. The customer had a Llumar security film installed to windows throughout their entire downstairs. Security window film will help keep glass in tact in case someone or something hits it. Window security film comes in different colors and thicknesses depending on location and what you are looking for. In this customers case they decided with going with the clear security film so the aesthetics don’t change and intruders won’t even know it’s there. You also have the option of having a reflective security film installed. Since it is a reflective window film it will look like a mirrored film or one way window film. Security film can increase the strength of glass by 2-3 times. If an intruder does try and break through the glass, it will prolong the time it takes them to get through allowing extra time for help to get there. Safety window film can be applied both on the interior and the exterior for added strength and is easily removable. Security film is often applied to businesses and stores where windows are the most common points of entry and very susceptible to being broken into. In addition to window security film, Solar Art also services anti graffiti film, solar film, decorative window film, custom graphics and exterior building wraps. If you are interested in security window film or any other window film for your home or office, contact Solar Art today for a free quote! Interested in Security Window Film? Contact us directly to talk about security film! Security window film strengthens glass by 2-3 times and helps keep glass in tact in case someone or something hits it. Security film blocks 99% of UVA and UVB rays and works great in both residential and commercial settings. Contact Solar Art to learn more!